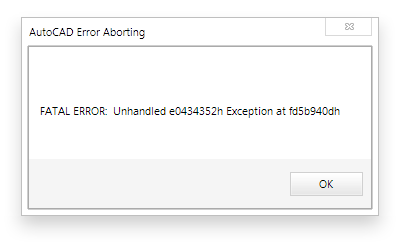 If you experience a FATAL ERROR while using your software, it is critical to our troubleshooting efforts that you send us the crash report generated by AutoCAD. This allows us to determine whether or not this is an AutoCAD error or a DrawTech error. If it is a DrawTech error this allows us to determine exactly where the error happened, thus allowing us to resolve your issue. Please follow these steps to send us your crash report. Note, not all crashes are FATAL ERRORS. For other crashes, you will not get the message below. Please know that when you receive one of the following message boxes, we cannot relate of the numbers or Exception values back to our software. This is nothing more than an indicator that something has failed. Please click OK on this message box to continue. 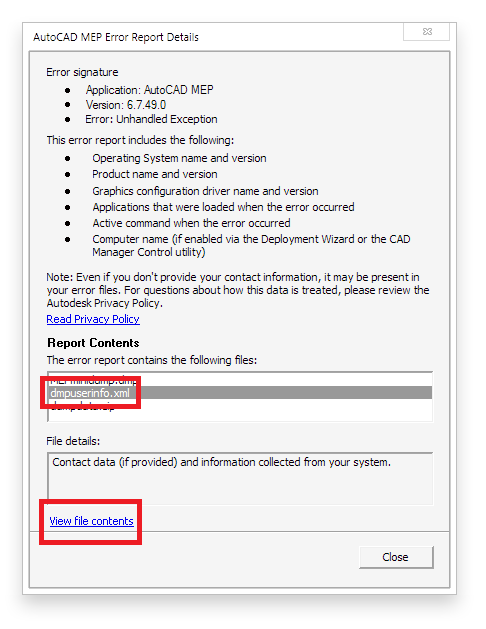 You should receive the following AutoCAD MEP Error Report dialog. Click the “View Report Details” button located at the bottom left of the dialog. 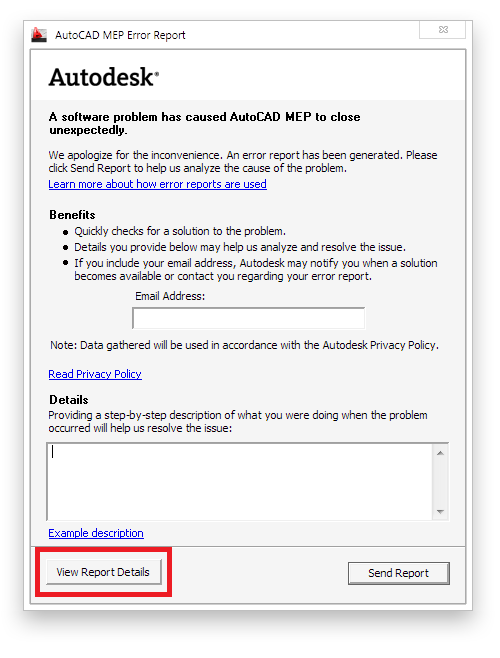 A new dialog should pop up titled AutoCAD MEP Error Report Details. The report contents should show you at least three files. Click on the “dmpuserinfo.xml” to select/highlight it in the list. Once that is selected, click the “View file contents” link at the lower left. 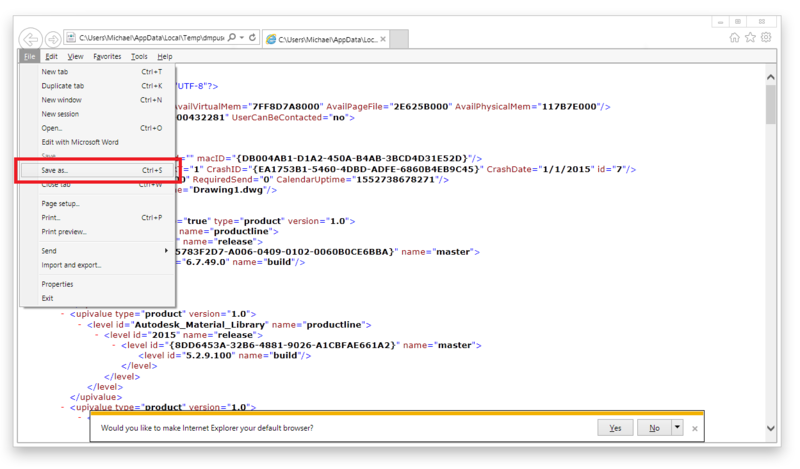 Finally, you will see the contents of the XML file pop up in your default XML program. The default program is usually Internet Explorer or Notepad. If it asks you which program you would like to open the file with, then you can select either of these two. The contents of the XML is what we need to look at in order to show us detailed information about the crash, where it occured, and what process was taking place during the crash. We need the contents of the entire file so in most cases it is easier to save that XML file to a specific location and then send it directly to us at support@drawtech.com. You can perform the save by pressing “Ctrl+S” or by bringing down the “File” drop down menu by pressing the “Alt” key on your keyboard and then selecting “Save as..” as shown in the screenshot below. It is at this point you can email us the dmpuserinfo.xml file at support@drawtech.com.